As I am going to visit my mum in Stranraer for the next few days, I was determined to have a good day in the studio and leave feeling good about my work. So I spent all day just working on my major Battle at Chichester Cross painting, and I think I made some headway. See what you think for yourself…. Well instead of annoying me as I expected it would, I rather got into a wee world of my own and just decided to paint for the pure hell of it. And I think I had a good day. 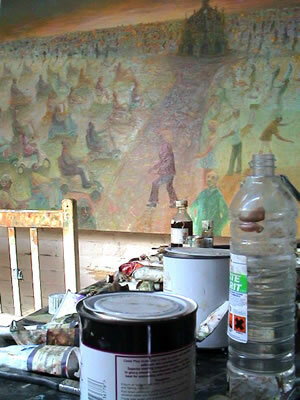 I had stopped protecting the figures on the left hand side which I had left since I blocked it in as I had liked the spirit of it. I also worked into the monument a bit and the receding background. Last thing today, I decided to put a dark and prominent figure of a women on the road facing the buggies as if to confront them verbally. Well, the ice cream van didn’t work there (sorry no pictures of that aborted attempt) so I thought – ‘what the hell’. And you know, it is a bit crude at the moment, but I think it is what the painting has been waiting for. It gives the painting more of a ‘subject’ which it was perhaps lacking. It is still terribly rough and badly drawn in places, but I think I can pull it off now. Going to have to wait a week until I come back from Scotland.